Last week, I talked about my complicated feelings towards Glossier. And then I gave a rave review of a product of theirs that most people consider overpriced Vaseline. This week, I’m going to talk about a product of theirs that I consider a staple of their line, despite not being offered originally: Milky Jelly Cleanser. Glossier apparently developed this cleanser based on a massive comment thread from a post on their sister site Into the Gloss. People wanted a gentle, non-foaming, oil-free, low-pH cleanser that was easy to use and removed makeup. They came up with this. Milky Jelly Cleanser is another of their products that is recommended for all skin types (remember, your mileage may vary with any and all skin care products). It is described as being like a jellied micellar water: a gentle, water-based cleanser to remove eye makeup and cleanse your skin without stripping it. And, honestly, it really delivers on this. I’ve been using the product for over a month now, so I thought I’d offer my thoughts. Spoilers: I liked this a lot more than I thought I would. When I first bought the cleanser, it was after a review from Tracy at Fanserviced-B, and I thought I would use it like she does: as a gentle morning cleanse. It was a splurge, especially for a cleanser I would only use once a day and not for removing makeup, but it sounded nice. Then, Caroline Hirons reviewed it and I was all the more intrigued. I think first, I should discuss the texture. It does rather have the texture of a slightly more jelly school glue. I find it very soothing, and have no problem using it on wet or dry skin, but others have found it easier to spread on dry skin. Second, the scent: Tracy likened it to rose-scented school glue, which I can kind of see. It has a light rosewater scent to it, but it’s not entirely enough to mask the smell of the other ingredients. But I agree more with Mrs. Hirons’ assessment: it smells like old-fashioned, floral-scented lipstick. Personally, I love it. I actually look forward to cleansing in the morning. I will be the first to admit that I’m weird, but if you like old-fashion rose scents, you may in fact love this. It doesn’t hurt, though, that I’ve always used unscented surfactant cleansers in the past, so I’m pretty used to the slightly plasticky smell they tend to have. Now, the cleanse. As I said, I started out using it only in the mornings. It’s a lovely quick cleanse that leaves my skin feeling clean but not stripped. It gets off my layer off nighttime occlusive and any sweat. It’s also amazingly gentle on the eyes. I have an old eye injury that acts up in the mornings sometimes, and generally the only thing that helps is letting the warm water stream over it in the shower. But I can wash my face at the sink with Milky Jelly and it seems to feel fine. Since I’ve started using it in the evenings as my second cleanse, I’ve also found that I get more of my eye makeup off because I do not hesitate to really work it into my eye area, unlike my foaming cleansers. About three weeks ago, I decided that I didn’t like the second cleanser I was using in the evening (it was lovely, but smelled of vanilla, a scent that I hate in cosmetic contexts), so I went ahead and started using Milky Jelly as my evening second cleanse as well. I was fully expecting it to be insufficient and lead to loads of clogged pores. Well, sometimes I like being wrong. I’m rather pleased that I can use this admitted-not-cheap cleanser for both morning and evening, and need only my homemade balm cleanser otherwise. Lovely. One final note: A lot of people have compared this to a more expensive version of Cetaphil or Cerave Hydrating Cleanser or Neutrogena Ultra Gentle Hydrating Cleanser. It is not. Period. End of discussion. The one place where this cleanser is head and shoulders above those is the pH. It is a low pH — advertised as 4.5 and measured as such by several bloggers who I trust. I have only used the Neutrogena cleanser, which has been measure at pH 6.2. Now this may not seem like a big deal, but when I was using it, I found it was giving me moisture-barrier-damage symptoms. Now that my skin is a bit healthier (that was back when I was coming off of using soap to cleanse my skin), I might try it again, but at the very least, I would use a pH-adjusting toner afterwards. Milky Jelly leaves my skin perfectly balanced and in no need of a toner. So if you’re worried that you’re buying something with a super-cheap dupe, please keep in mind that Milky Jelly is a lower pH than the supposed dupes, which does make a difference. 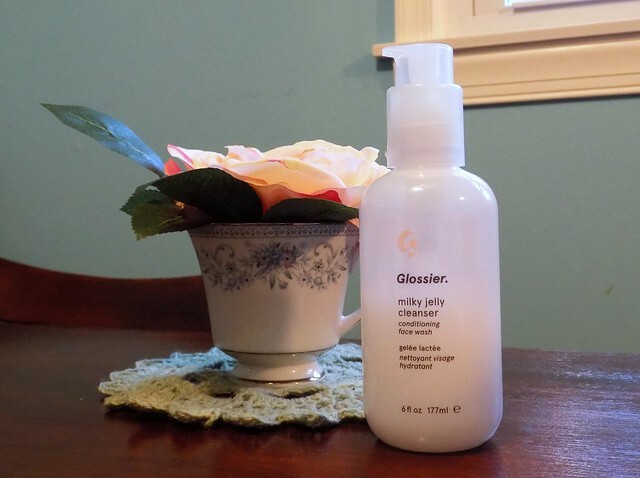 Update: While I wrote this review without any compensation or ulterior motive, and the links in the main body of the review are the same as they were originally, I have since joined the Glossier referral program. If you would like to support this blog and earn 20% off your first order, please access Glossier through this link.